Four Rochester undergraduates and two graduate students have been selected to receive National Science Foundation Graduate Research Fellowships, part of a federally sponsored program that provides up to three years of graduate study support for US students pursuing doctoral or research-based master’s degrees in STEM, STEM education, and social science fields. Candidates, who must demonstrate outstanding scholarly promise and leadership potential, apply for the NSF either the year before entering graduate school or during the first or second year of their graduate degree programs. Hayden Carder ’18, a chemistry major from Hinsdale, Illinois, will begin his PhD in chemistry this fall at Massachusetts Institute of Technology. A 2017 Goldwater Scholar, he plans to immerse himself in an emerging area of chemistry that optimizes the desired properties of a molecule to solve crucial problems facing society. Lauren Oey ’18, a triple major in brain and cognitive sciences, statistics, and linguistics, will pursue a PhD in computational cognitive psychology at the University of California-San Diego. The Mountain Lakes, New Jersey, native hopes to develop computational models of the human mind, examining how people develop their abilities to communicate and learn from one another. Ryan Rubenzahl ’18, a physics and astronomy major from Lowville, New York, will attend California Institute of Technology to pursue a PhD in astrophysics. Also a 2017 Goldwater Scholar, he will focus his research in observational data-driven astronomy involving surveys. Janet Sorrells ’17, ’18 (T5), a biomedical engineering major from Harvard, Massachusetts, will pursue a PhD in bioengineering at the University of Illinois at Urbana-Champaign. Her research project will be in the field of biophotonics. Sarah Henry is a second-year graduate student from Benson, North Carolina. She received her undergraduate degree in physics from Texas A&M and is a high-energy neutrino physics doctoral student with a focus on pion production. Her supervisor is Professor Kevin McFarland-Porter. Henry will continue her analysis of neutrino cross-sections while spending seven months at the European Organization for Nuclear Physics (known as CERN) in Geneva, Switzerland. Aleza Wallace is from Narberth, Pennsylvania, and received her bachelor’s degree in psychology from the University of Pittsburgh. The second-year graduate student is pursuing a PhD in social psychology, and her supervisor is Professor Andrew Elliot. She plans to continue her research on academic motivation and how to implement strategies at Rochester. 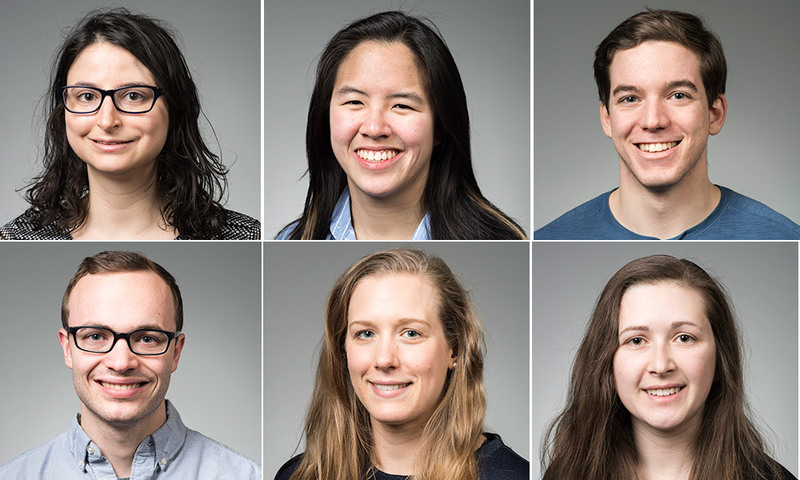 Six Rochester alumni also were chosen as NSF Graduate Research Fellows: Ethan Gyllenhaal ’17, Ramsey Ismail ’13, Carla-Keyanna Macias-Cervantes ’16, Megan Routzong ’16, Brittany Schutrum ’17, and Alexander Teghipco ’14.